The Mediterranean diet is based on the traditional eating habits of countries like Italy and Greece. Other countries surrounding the Mediterranean sea have different versions of the diet. These include Spain, France, Morocco, Malta, Turkey and Israel. Variations occur depending on local ingredients. The Mediterranean Diet isn’t exclusively a ‘diet’. It refers to the common dietary practices of the people in the Mediterranean region. Sharing meals with other people and enjoying life. It is the overall approach and combination of foods that makes the diet healthy, rather than individual ‘superfoods’. 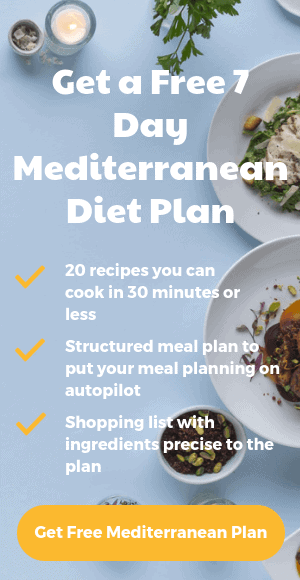 The Mediterranean diet is also one of the easiest diets to stick to long-term. It’s delicious flavours and low cost make it a practical solution for most people. The Mediterranean diet doesn’t cut all food groups — we all need a treat occasionally. Saying that, you should avoid these unhealthy foods as much as possible. Highly processed foods & meats: Everything labelled “low-fat” or “diet”. The Mediterranean pyramid below gives a sense of the proportions and frequency of food group servings that make up the diet. At the bottom are common staple foods that are to be consumed in large amounts and more frequently. Portion sizes and frequency decline as you go up the pyramid. The pyramid intentionally does not specify recommended weights of foods or calories. It is only meant to provide an overall look at healthy food choices and the relative proportions. It does this because good health has been attributed to variation within the overall dietary pattern. The more variety you get within the specified relative allowances per category – the better.